The Traditional Chinese Medicine treatment you might not have ever tried...but NEED to! ASAP!! Today I want to shed some light on a great TCM treatment called "Gua Sha". As I've come to understand, it is the ancient practice of scraping the skin to remove toxins from the body and improve circulation. The facial version of "Gua Sha" is much more gentle than the acupuncture version, which leaves behind huge red bruises on the body. I didn't know "Gua Sha" actually existed until my facialist, Nancy, suggested it to me. I think she was frightened by the huge pollution bags under my eyes. Rightfully so, since I work outside on the sports field all day, and expose my poor sinuses to toxic pollution and allergens all year long. Not to mention the effect of sweating all day long at work and not having enough time between classes to wash my face. Gross, I know. I'm actually embarrassed to post this picture because I look TERRIBLE in the "before" (and what's up with the duck lips, I don't know), but WOW! the ugly "before" picture only further emphasizes how amazing "Gua Sha" is, as you can see in the "after". The good, the bad and the ugly (in reverse order). 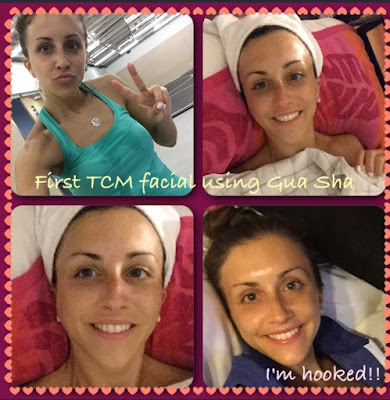 Beyond the cosmetic improvement of using "Gua Sha" treatment (good-bye black raccoon eyes! ), I physically feel less weight under my eyes, I feel less weight in my eyelids, and even in my eyebrows, I feel a lift. The treatment itself is a strange feeling, but not painful. It was a bit awkward as Nancy's jade rocks pressed on my eye bones and literally crunched along the length of them. I asked her why the rocks made the crunching noise, and she said because my sinuses were so blocked. If you are still confused about the harmful effects of pollution on your body, I invite you to get a "Gua Sha" treatment! Those jade rocks will literally rock your world! The best part of all, being that this is Shanghai, you don't have to leave your house to get your dose of "Gua Sha". Nancy will come to your house and give you this amazing treatment for the very affordable price of 30¥. 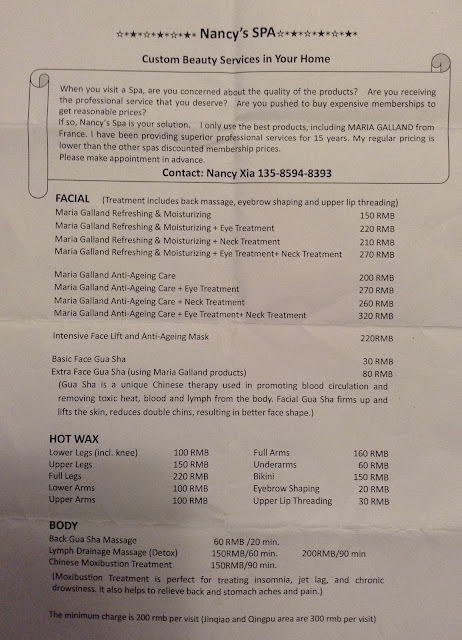 As you can see in her price list, Nancy also does other beauty treatments like manicures and pedicures in home, but since she comes alone, it's not the fastest service in the world. If you're in a rush, you're probably better off going to Helen's Nail Spa, where two ladies will work at the same time to give you a manicure/pedicure. I can't speak for her other services either, like waxing, but I presume she's pretty gentle (well as gentle as waxing can be!). Nancy has taken good care of me throughout the past four years and besides being really professional and talented at what she does, she has a young daughter to support, so I'm happy to support her small business as best I can.